Our in-house mechanical department makes and refurbishes steel, aluminium and stainless steel frames based on drawings or measurements of existing rollers. We have our own engineer who creates new drawings in 3D. We can handle up to Ø 1295 x 13,500 mm and 28 tons in weight for steel work over the full length. In our brand new Doosan Puma 3100ULM we can handle Ø 420 x 3200 mm, the machine it self can turn, bor and mill. In our small Gildemeister CTX 400 we produce smaller shafts and details in dimensions Ø 255 x 635 mm, the machine it self can turn, bor and mill. 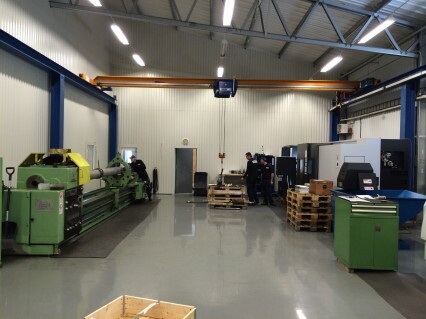 In the conventionel lathe TOS SU 100 x 6500 mm we machine pipes, remove broken shafts. We can crimp new bearing casings, weld, electrolyse and lathe, as well as grind. We straighten or change crooked plugs and grind new grooves. If customers so desire, we can also make measurement checks of bearing mountings, etc. when recapping, for example.